BPA-free Polyclean Custom Water Bottles - 28 oz. BPA-free copolymer custom water bottles give you the features and beauty of an imprinted polycarbonate water bottle at half the price! 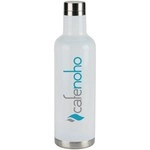 Wide Mouth Logo Stainless Steel Water Bottle - 16 oz. 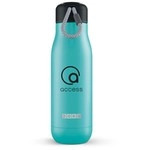 Logo stainless steel water bottle in a variety of matte metallic finish colors.